Trump faces again the consequences of his insensitivity. Storms, fires, shootings and failures sum up the brief presidency of Donald Trump. The killing of four US Special Forces soldiers on the border between Niger and Mali on October 4 - which many have called the "worst fighting incident" since the tycoon took office – adds up to that list. The "Green Berets" were part of the 3rd Special Forces Group assisting their Nigerian counter-terrorism counterparts when they were caught in an ambush in a remote area of the country, according to The New York Times. When the news was known, the American president didn’t mention it and maintained a quixotic fight on Twitter against the media, which lasted for several days. After clarifying the circumstances and knowledge of the deceased soldiers, President Trump remained undeterred, among golf games, injured pride (with the NFL, for example), and political ghosts. The surprise for all was, as the Washington Post described it, "a president who revels in providing color commentary on the news said nothing about what happened in Niger for 12 straight days”. It was not until last Monday that a journalist interviewed him in the Rose Garden asking about his atypical silence on the case. The president's response, between incongruous excuses, was again to assume that his response to the soldiers "who have made the last sacrifice" has always been better than that of his predecessors, especially Barack Obama. "I felt really bad about it ... those are always the most difficult calls I have to make," the president said. "All I can do is ask my generals. Other presidents never called. They wrote letters, and some never did anything," he said. Being of public knowledge what Obama and Bush did in similar circumstances, a reporter demanded that Trump explain if he really believed that was true, and the President stumbled trying to reconstruct what he had said. "I do not know if he did," he said of Obama. "I was told he didn’t do it often, and many presidents don’t. They write letters. I do, I do a combination of both, "he explained. According to White House officials, the full report on the deceased and the circumstances in which the events took place did not reach the president until Monday when he proceeded to call the families of the victims. One of them was the widow of Sergeant David T. Johnson, Myeshia Johnson. 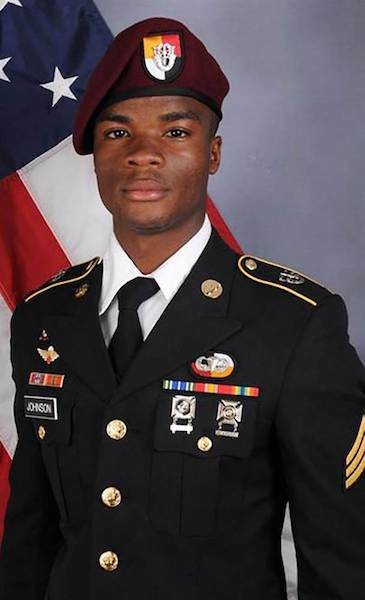 As the Democratic House Rep. Frederica S. Wilson - who accompanied the widow at the time of the call – said, President Trump's comments were more than insensitive. "He told her that he knew what he was signing up for, but I guess it hurts anyway”. Wilson recalled in an interview with the Washington Post that Johnson burst into tears. "I wanted to pick up the phone and curse him”, said the congresswoman. The White House didn’t deny the comments. Instead, it issued a statement saying that, "the President’s conversations with the families of American heroes who have made the ultimate sacrifice are private”. But on Wednesday Trump defended himself through his Twitter account claiming that Wilson's statements were "completely fabricated" and that he possessed "proof" that the conversation had not been carried out that way. In an interview with MSNBC, Wilson maintained her comments and said that the president's call had been "horrible and insensitive." "(Johnson) was crying, and said 'he didn’t even remember his name,'" Wilson said. Also, in a commentary with CNN, Wilson called Trump "a sick man." The president defended himself using a specific example, that of his chief of staff, General John Kelly, one of whose children died while serving in Afghanistan in 2010, according to EFE. "You can ask General Kelly if he got a call from Obama. You can ask other people. I don’t know what Obama's policy was. I write letters and I also call," Trump said in a radio interview with Fox News. This is not the first time that President Trump's insensitivity stains his management. Peter Wehner, an advisor and speechwriter for President George W. Bush, said in an interview that, "communicating empathy and compassion has been for Trump as 'speaking a foreign language.'"